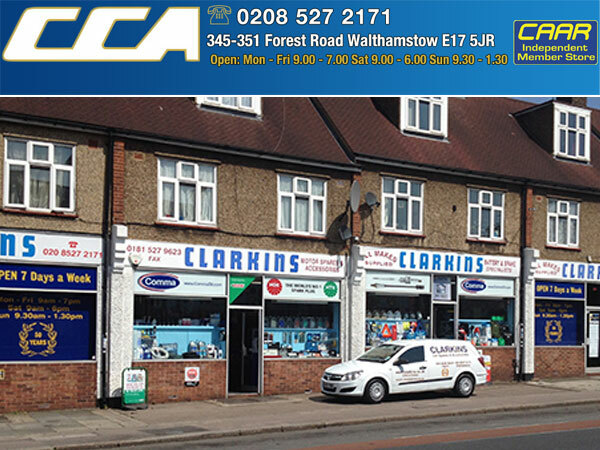 Clarkins Car Accessories Ltd is a car parts and accessories shop and an independent member of the CAAR group offers widest range of car parts accessories and leisure products. 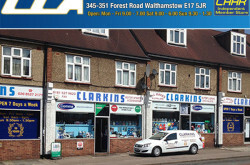 Clarkins Car Accessories Ltd service includes Buy Online – Collect In Store. Car Parts – Battery, Brake Friction, Cables, Clutch Friction, Cooling & Heating parts, Electrical parts, Engine Parts, Exhausts, Filters, Fuel & Engine Management parts, Hydraulic parts, Ignition parts, Lighting parts, Lubricants & Fluids, Roof Bars, Mirrors & Mirror Glass, Service Parts, Steering & Suspension, Transmission, Wipers, Workshop Manuals etc. For Car Maintenance – Antifreeze & Coolant, Body Repair Maintenance & Paints, Deicer, Haynes Workshop Manuals, Maintenance & Workshop, Oil Fuel & Cooling Additives, Oils & Lubricants, Screenwash, Work Clothing & Footwear etc. Valeting products – Polish & Wax, Colour Restorer, Shampoo, Wash & Wax, Traffic Film Remover, Wheel & Tyre Products, Exterior Products, Interior Products, Glass Cleaner, Soft Top Care, Motorcycle Cleaner, Espuma Professional Valeting, Sponges Washcloths & Leather, Brushes Buckets & Hoses, Polishing Cloths Dusters & Pads, Valeting & Gift Packs, Electric Polishers & Pads, Car Vacuum Cleaners, Armorall, Astonish, Autopro, Castrol, Comma, Decosol, Farecla, Granville, Kent, Mer, Nilco, Renovo, STP, Simoniz, Swarfega, Wynns etc. Hand & Power Tools – Air Tools & Airline, Battery Chargers & Booster Packs, Tool Boxes & Storage, Breakdown & Emergency tools, Cutting Tools & Blades, Cutting & Grinding Discs, Footpumps Compressors & Tyre Gauges, Fuel Cans Funnels Measures & Sprayers, Hand Tools, Jump Leads & Booster Cables, Lifting Tools, Inspection Lamps, Power Tools & Accessories, Safety & Protection tools, Special Tools, Test Equipment, Sack Trucks & Trolleys, Welders & Welding Accessories, Wire Brushes & Drill Wheels etc. Accessories – Accessories & Styling, Air Fresheners, Car Covers, Cycle Motorcycle & Scooter Covers, Decals & Striping, Interior & Exterior Mirrors, Learner Driver Plates, Mobile Power, Performance Accessories, Seat Covers & Mats, Spare Wheel Covers, Tax Disc Holders, Vehicle Security, Wheel Trims, Winter Products etc. In Car Technology – Aerials and Aerial Adaptors, Acoustic Cloth and Carpet, Head Units, Car Audio Fitting Solutions, Central Locking, Portable Charging, Inverters, Radio Release Keys, Dashboard Mounts, Phone & Bluetooth Connectivity, Parking Sensors and Cameras, Sub Boxes and Accessories, Speakers & Kits, Wiring and Cables etc. Touring & Leisure – Camping & Caravanning, Caravan Covers, Cycle Accessories, Cycle Carriers, Dog Guards, Roof Bars & Boxes, Tie Downs & Ratchet Straps, Torches & Lamps, Touring Essentials, Towing and Trailer etc.